[Steve Thomas] has great caregivers, but listening to his story in Eyedrivomatics’ Hackaday Prize Finals Video really makes the need for this functionality easy to understand. Just being able to move from his room to the dayroom to go hang out with his friends is something he cannot do by himself. Eyedrivomatic returns that freedom to him. As if that weren’t enough, the application of this technology isn’t locked into just one specific use. The project comes in two parts, separating the actuator from the controller. This will make it possible to adapt it for inputs other than eye control, or to use eye control for something other than a joystick-form-factor electric wheelchair. The project creators have brainstormed ideas to extend this to control IR devices like televisions, as well as a few other applications. I would argue that Eyedrivomatic is a perfect use case for the commonly available hardware that was chosen. The “brain box” electronics include an Arduino Uno, a Relay Shield, and a Servo Shield. 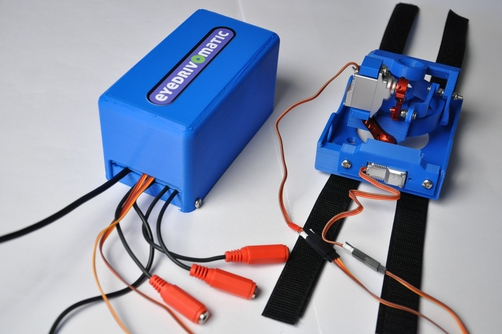 The “electronic hand” portion uses Turnigy 380 servos. Eyedrivomatic is unlikely to see major manufacturing. It’s purely a numbers game: how many electric wheelchairs are in use, and how many of those people are unable to use their hands to drive them? But obviously it’s still worth building. The solution is to design the project with 3D-printed parts, Arduino shields, and stock servo motors — all materials that a vast number of people are comfortable working with. It will not be difficult for anyone interested in this technology to find someone to help build and implement it. Check out the extremely well-presented build instructions (Dropbox PDF) and you will agree that the team has hit a home run with this one. For example, when I had first been looking at how the system is organized I wondered about connecting the wires to screw terminals. But they’ve thought of everything, including both adhesive and clamping to ensure a snag doesn’t tear the wires loose. This is robust, attainable, and it works! Kudos to the Eyedrivomatic team. You have built something incredible whose purpose is to make people’s lives better, and you’ve made it both accessible and replicable. This deserves to be celebrated. The 2015 Hackaday Prize had over 900 entries. This field was narrowed to 100 Semifinalists and to 10 Finalists. We’ll be publishing more about these inspiring and important initiatives in the coming days. For now, enjoy the recap video of the 10 Finalists, and dig into the lists linked in this article to learn more. This is something all DIY types no matter what they choose to call themselves should file in the back of their minds for ” just in case”. I survived a severe stroke at age 37. I recall sitting in a wheel chair that I couldn’t use easing thinking, man I’m screwed now. Luck being relative I regained the ability to walk Projects like these touch me somewhere what’s left of my brain. Particularly when he spoke of their impending deaths and the desire to see this live beyond them. I will be sending this information to the independent living organizations in my area for their input. Congrats Patrick and team! Rightfully earned. This is awesome! Mark that for another win for technology! Being someone who has seen people in wheelchairs, either due to strokes or ALS or something else, this is absolutely amazing. Thank you for sharing and I definitely think this deserves the Hackaday Prize! My brother and sister both are unable to move and in wheelchairs. You guys deserved this honor by far! A worthy winner of the HaD prize! Making a difference in your surroundings is what it’s all about. There is a commercial solution for this. Abilia has been offering eye gaze wheelchair control for many years.